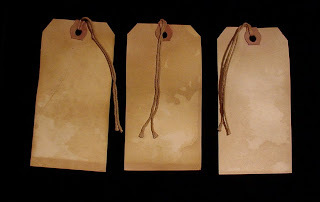 These tags make great personal touches for gifts, or, if you’re a crafty, use them in altered art and scrapbooking projects. 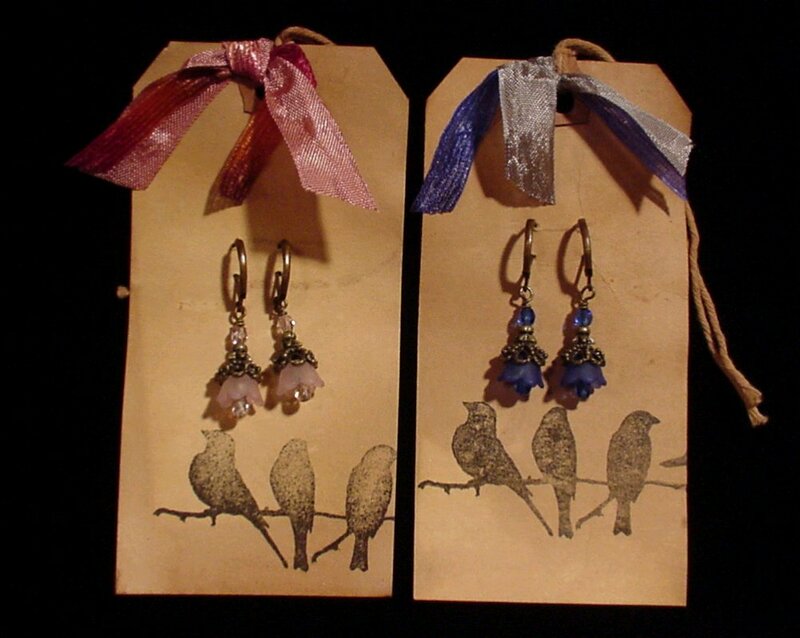 If you sell your work, use these as jewelry cards or hang tags for your handcrafted items, as I have done above. Manila hang tags –available at office supply stores, or if you prefer you can cut your own from cardstock. I prefer to use the purchased ones, just because it is more time efficient for me. Brew a strong pot of tea and when cooled, pour it into a medium pot (I keep the teabags in). You can brew the teabags right in the pot on the stovetop. 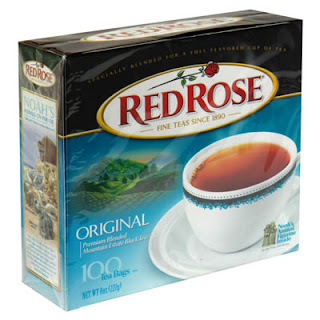 I use about 6 teabags per every 4 cups of water. If you prefer you can use coffee instead of tea. Submerge and soak the manila tags in the cooled tea until stained and saturated. They do not have to be evenly stained. The less-even the stains are, the better. You can either just dip them for a lighter look, or you can allow them to soak for a while for a deeper shade. Experiment until you achieve the look you like. 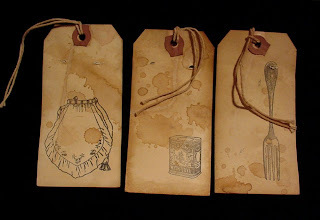 When the tags are the color you like, remove them from the tea soak and lightly blot them on an old tea towel. Next, arrange them on a cookie sheet and bake in a warm oven (about 200-250 degrees F) until they begin to dry. Watch them carefully so that you do not burn them. Then remove them from the oven. This step is optional, but I like to go the extra mile for the look: spritz the tags with a spray bottle filled with tea or coffee to add some extra, darker stain marks. If you don't want to use a spray bottle you can just randomly drip the tea on your tags. This step helps them look old and worn or grungy: that is the look we are going for. Bake again for just a few minutes until dry and remove from oven. I love drip stains on my tags! 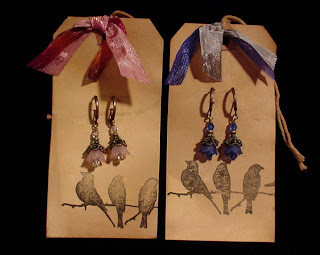 Embellishing: Once your tags are completely dry you can rubber stamp them with designs. 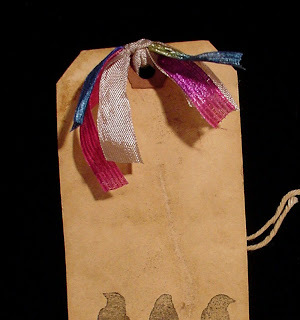 Using the rubber stamp and stamp pad, stamp your tags with whatever designs you desire. Some nice stamps that I like to use are seasonal designs and nature designs. 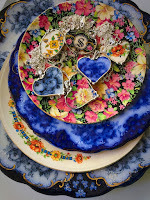 You can stop here and use your tags as-is, or read on for more embellishment ideas. *Thread a few scraps of ribbon through the hole in the tag and tie for a colorful look (see below). I coordinated these earrings to the ribbons to complete the look! 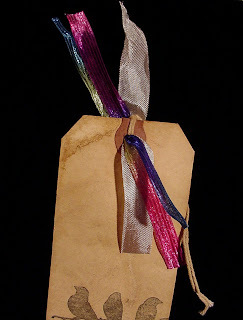 *Use rubber stamps to decorate carnival tickets, punch a hole in each with a hole-punch and then attach these with ribbon through the hole on the tag (as shown above). Or, if you prefer, use a glue stick and glue the carnival ticket directly to the tag. *Distress the edges of your tags by running the edge of the tag along the stamp pad or by tracing along the edge of the tag with a marker. 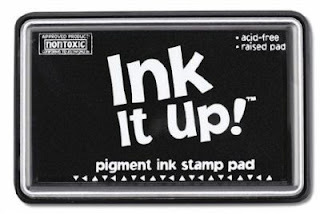 *Add some color to your rubber stamp designs by coloring with colored pencil. 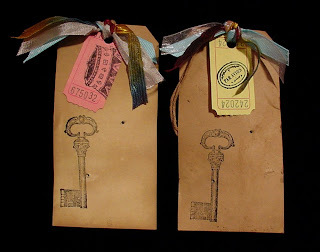 *Add vintage ephemera to your tags with a glue stick for an altered art look. 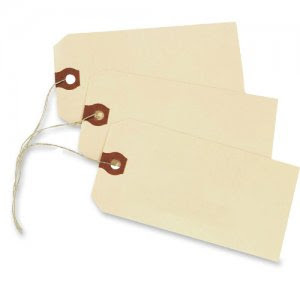 *Good idea: If you’re using these as tags for items you are going to sell or as jewelry cards, use the reverse side to write pertinent info about your item (such as materials used, etc), or, stamp the reverse side with a sticker or personalized rubber stamp to advertise your business name and/or website. I had a custom rubber stamp made by Etsy seller terbearco, and I love it! Great post-- I am totally inspired! These are great! Thanks for the wonderful tutorial! You're welcome Sheryl, thanks for visiting! Lovin' this clever and creative post! Thanks SO much! Great idea and post! I love these and will definitely be trying these! this is so cool I love it! If any of you try this be sure and let us know how awesome they turn out! Glad I read your tutorial as I have been doing something similar but without the bake and the extra stritz...no wonder thay were looking a bit plain. Thanks for the tips! Great! Glad you liked the post.